Back in the Thirteenth Century, King Henry III granted a plot of land in the heart of London to an order of Friars known as the Carmelites. In return, they entered into a compact with God to guard a holy object. This sanctuary became a refuge for many of ill-repute, as the Friars cast no judgment and took in all who were in search of solace. Known as Alsatia, it did not suffer like the rest of the world. No Plague affected it. No Great Fire burned it. No Blitz destroyed it. Within its walls lies a secret to existence – one that has been kept since the dawn of time – a bevy of creation, where reality and romance, life and death, imaginary and real share the same world. One young man’s entrance into this realm sends a shockwave of chaos through time. What lies at the center of this sacred realm is threatened for the first time in human existence. Moorcock, writer of the Elric of Melniboné and Corum series, is a legend among the ranks of Robert E. Howard, Jack Vance, and Roger Zelazny. 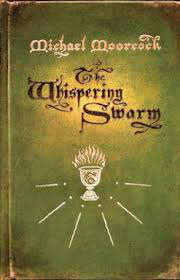 He writes beautifully and tells wonderful stories, filled with lore and magic and tends to be very dark. He is one of my most read authors having read 20 of his books and even though his books fall on the shorter side in Sword and Sorcery style, they do not lack depth or world and character building. He makes every word count and everyone should try his work. I hope that with the advent of this information age this work will become heavily promoted for all audiences because I believe all fantasy readers will enjoy his style. 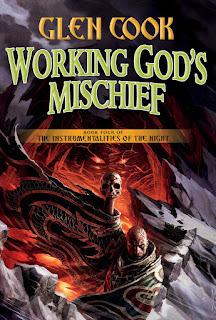 Another book to look forward to is by another legend, Glen Cook called Working God's Mischief, book number 4 in his Instrumentalities of the Night series. I have had this in my next to start pile for some time as I have read several Glen Cook books, all of which were excellent, especially his most known work, The Black Company. I have a feeling that the Instrumentalities series is very underrated based on his work I have already read. Hopefully, my anticipation for this release will inspire me to start this series sooner rather than later. Better yet; I win an ARC on Goodreads! The cover is also outstanding. Glen Cook is a good one. At least I've heard as much. A few friends of mine are really into his "Instrumentalities" series. Richard, that's great news for me! I have been excited about the "Instumentalities" series for some time now. If only I didn't have SO much to read! Hopefully I will get to them this year. If this Cook series is half as good as the Black company which I have recently began reading then I will be a very happy man! David, that's my thought also. I enjoy Black Company so much I have only read the first book! I want them to last. As for this, I think the first book is over 700 pages so that's why I'm waiting to begin.